Source: CICH graphic created using data from Health Behaviour in School-aged Children in Canada: Focus on Relationships, 2015. According to a scale* measuring youth in Grades 6, 8 and 10 reports of family support, there were differences in reported family support among Grade levels. Students in Grade 6 were the most likely to report that they had high family support and least likely to have low family support. Students in Grade 10 had the opposite experience. 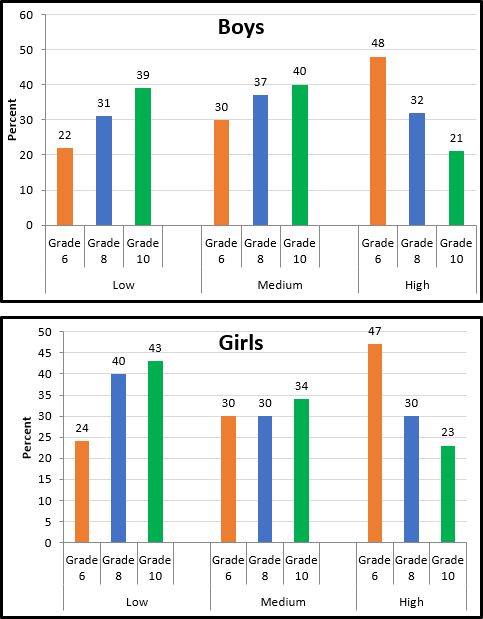 The only difference between girls and boys is in Grade 8, with girls being more likely to be in the low group than were boys. My family really tries to help me. I get the emotional help and support I need from my family. I can talk about my problems with my family. My family is willing to help me make decisions. 1Elgar, F. J., Craig, W., & Trites, S. J. (2012). Family dinners, communication and mental health in Canadian adolescents. Journal of Adolescent Health, 52(4), 433-438. 2Gutman, L. M., & Eccles, J. S. (2007). Stage-environment fit during adolescence: trajectories of family relations and adolescent outcomes. Developmental Psychology, 43, 522-537. 3Duncan, G. J., Ziol-Guest, K. M., & Kalil, A. (2010). Early childhood poverty and adult attainment, behaviour, and health. Child Development, 81(1), 306-325. 4Pungello, E. P., Kainz, K., Burchinal, M., Wasik, B. H., Sparling, J. J., Ramey, C. T., & Campbell, F. A. (2010). Early educational intervention, early cumulative risk, and the home environment as predictors of young adult outcomes within a high-risk sample. Child Development, 81, 410-426. 5Freeman JG, King M and Pickett W. Health Behaviour in School-aged Children (HBSC) in Canada: Focus on Relationships. 2016.